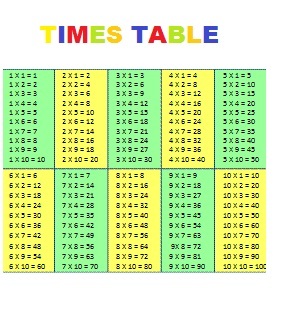 In this topic 2times table we have given the multiplication table.Multiplication is nothing but adding the same number over and over. This is also called repeated addition .For example let us take the multiplication problem 2 x 3. For calculating the answer we can use the multiplication tables. In that we have 2 x 3. The answer for that is 6.other wise we can apply the continuous addition method that is adding 2 as three times that is 2 + 2 + 2 .The answer will be same.This is why multiplication is known as repeated addition over and over.The symbol × indicates multiplication. Multiplication means to have many groups of the same size.the process of repeating, or adding to itself, any number or quantity a certain number of times; commonly, the process of ascertaining by a brief computation the result of such repeated additions; also, the rule by that the operation is performed; -- the reverse of division.Division means splitting the number that is decreasing process.But multiplication means increasing process.After memorizing this 2times table and all multiplication table you can try our multiplication worksheets to improve your knowledge in the topic multiplication. If there are 60 minutes in one hour,how many minutes are in 24 hours. For calculating this we can apply two methods. The first method is little big,because we have to add 60 as twenty four groups like (60+60+60.............24 times)instead of this method we can use multiplication table for that we can to memories the multiplication table. we can simply multiply 60 and 24 to get the answer.For this kind of purposes we are using the multiplication table .The another name of multiplication is product.Once you memories this table it will be very useful to do multiplication with big numbers. We welcome your valuable comments for the improvement of our page. Please use the link below to express your comments.